Climate change is one of the defining issues of our age, and caring about its effects on all of creation is a vital part of our discipleship as Christians. The very first thing the Bible teaches us is that creation is good. As recoded in Genesis 1, God created the light, land, sea, vegetation, the sun and moon, fish, birds and every living creature and ​“saw that it was good”. The earth and everything on it reflect the wonder of God and our concern for creation should be rooted in our worship of the God who made it all. Pastor and theologian Timothy Keller says God entered into a covenant relationship with His creation after the flood to save it from humanity’s sin: ​“When the bow is in the clouds, I will see it and remember the everlasting covenant between God and every living creature of all flesh that is on the earth” (Genesis 9:16). This shows God’s heart for all that He brought into existence and His desire to see us take care of what belongs to Him. This becomes all the more clear when He assigned humankind its first task, which was to work and take care of creation: ​“The Lord God took the man and put him in the garden of Eden to work it and keep it” (Genesis 2:15). God appointed Adam steward of the garden, to take care of it and cultivate it. Stewardship, therefore, is an act of worship and obedience towards God. “Love the Lord your God with all your heart and with all your soul and with all your mind and with all your strength.’ The second is this: ​‘Love your neighbor as yourself.’ There is no commandment greater than these” (Mark 12:30 – 31). Climate change could push more than 100 million people back into poverty by 2030 if we don’t do something about it, and it threatens to undo decades of development work. This is why loving our poorest neighbours involves us caring about the environment and our climate change. Higher temperatures make a range of weather-related disasters more likely, such as droughts, floods, rising sea levels, cyclones, wildfires, and loss of biodiversity. The consequences of these climate hazards will inflict the most damage on the poorest countries that have contributed least to climate change. These countries are located in the regions of the world most likely to be adversely affected, and they are least able to deal with the impact of these weather shocks because of their dependence on natural resources and their limited capacity to cope with climate variability and extremes. As Christians who strive to love our neighbours, we have another reason to care about tackling climate change: it is hurting the poorest people around the world. 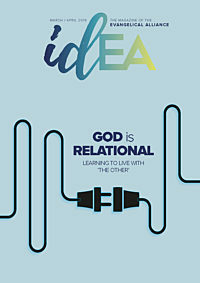 Towards the end of last year, the Evangelical Alliance dedicated an entire edition of idea to ethnical living, which explored perspectives of justice and mercy. We spoke with Tearfund, which works on tackling climate change, as well as other member organisations and churches that agree Christians should be doing more to care about all of God’s creation. Hazel MacIver is the campaigns and advocacy manager for Tearfund Scotland. Hazel takes the voice of the world’s poorest people to the heart of Scottish politics, lobbying politicians and mobilising the church.